Dubai, UAE, November 04, 2018: Carl F. Bucherer CEO Sascha Moeri presented the new Heritage Tourbillon DoublePeripheral Limited Edition at a celebratory event in New York's vibrant SoHo district. The launch of this timepiece marks one of many highlights in the company's anniversary year and pays tribute to the rich tradition of the Swiss watch manufacturer from Lucerne. Limited to only 88 watches, the special-edition masterpiece also marks the start of a new product range set to carry on Carl F. Bucherer's legacy: the Heritage collection. New York, USA. October 30, 2018. 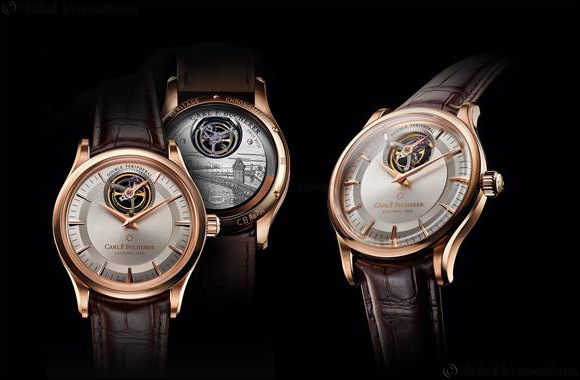 To round off its anniversary year celebrations, Carl F. Bucherer is launch- ing a limited-edition timepiece, paying homage to the multifaceted history of the Lucerne watch manu- facturer. “The Heritage Tourbillon DoublePeripheral Limited Edition is the embodiment of 130 years of sophistication at Carl F. Bucherer. We are proud of this exceptional timepiece, which is a tribute to our long tradition and at the same time heralds the arrival of a new range of products: the Heritage collection,” an- nounces Sascha Moeri, CEO of Carl F. Bucherer. The first model from the new Heritage collection is limited to just 88 pieces – a homage to the year Carl F. Bucherer was founded, 1888. The cosmopolitan and internationally renowned luxury watch man- ufacturer was established in Lucerne in the heart of Switzerland. The new timepiece reflects the golden luster of the baroque city itself, with an elaborately finished 42.50 mm, 18-karat rose gold case. Another homage to the birthplace of Carl F. Bucherer is the movement bridge crafted in 18-karat white gold, which features a hand-engraved cityscape of Lucerne. It covers the entire back of the movement, with the excep- tion of the tourbillon. At the center of the intricate engraving – the result of more than two weeks of meticu- lous craftsmanship – is the Lucerne Chapel Bridge, the landmark of the city. There is a special detail in this engraving: a swan. This reference to Lucerne's Schwanenplatz alludes to where Carl F. Bucherer opened its first specialty store back in 1888, not far from where the boutique is located today. The position of the swan differs on each of the 88 models – a custom feature that further underlines the unique character of each of these timepieces. The shape of the case and the design of the dial, featuring a sunburst finish and milled rings decorating its periphery, paired with striking diamond-shaped indices, were inspired by various vintage watch models from the 1960s. The brand thus combines retro design elements with state-of-the-art manufacturing technologies, thereby successfully bridging the gap between the past and the present, into a bright future. At the heart of the Heritage Tourbillon DoublePeripheral Limited Edition is the in-house CFB T3000 caliber, featuring a tourbillon and an automatic winding system that are both mounted peripherally. The innovative movement was presented for the first time at this year's Baselworld and is the only of its kind worldwide. With the CFB A1000 caliber, Carl F. Bucherer started series production on the first-ever movement powered by a bidirectional automatic winding system with a peripheral rotor. This technology was further refined in the COSC-certified CFB A2000 movement. The culmination of this innovative developmental work came in the form of the CFB T3000 caliber. The tourbillon is regarded as a highlight of the art of watchmaking and, in their latest caliber, the designers and watchmakers at Carl F. Bucherer have succeeded in giving it a floating appearance. The cage of the minute tourbillon is supported peripherally – and invisible to the viewer – by three ball bearings. These frictionless built-in ceramic ball bearings ensure a stable connection and precise guidance. Carl F. Bucherer also took an innovative approach to the escapement design, using non-magnetic silicon for both the pallet and the escape wheel. The Heritage Tourbillon DoublePeripheral Limited Edition has a power reserve of 65 hours and is a certified chronometer. To celebrate the company's anniversary and this limited-edition timepiece, the movement's peripheral rotor was crafted in 22-karat rose gold – a perfect match to the watch case, also made of rose gold. 130 years. Beautiful and innovative timepieces that epitomize quality, passion, and the utmost precision are born out of a rich heritage and a firm eye on the future. A long history of triumphs in watchmaking design and technology has led to Carl F. Bucherer's acceptance into the exclusive circle of the Fondation de la Haute Horlogerie. This is testament to the Lucerne watch manufacturer's continual endeavors to uphold the values of traditional watchmaking as well as its outstanding craftsmanship and sophistication.